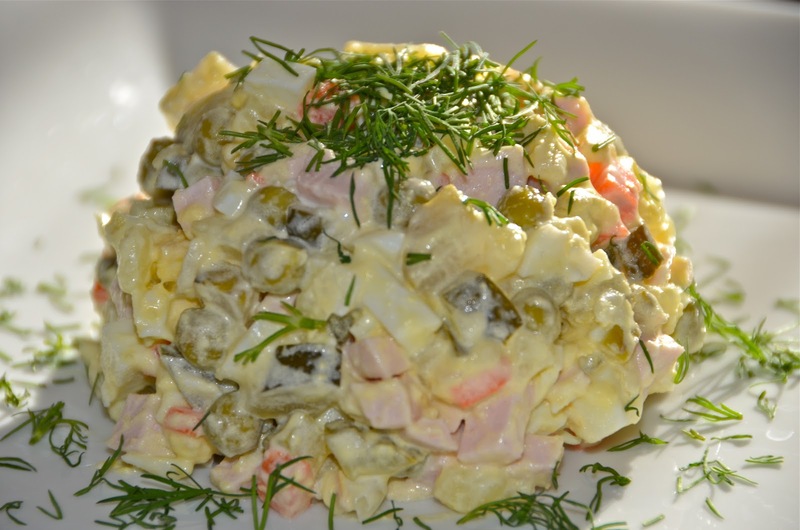 This salad is very famous in Russian/Ukrainian culture. 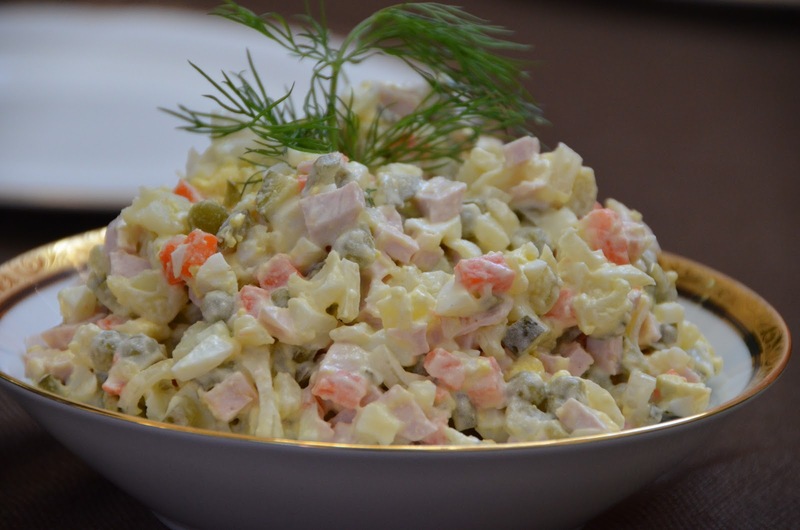 It’s a must on the New Year table.As always there is different variations of this salad,every family has their own recipe.It consist of diced potatoes,carrots,eggs, bologna, pickles and peas that’s usually combined with mayonnaise. You can also substitute bologna for cooked chicken meat or beef,fresh cucumbers instead of pickles, and sour cream for mayo if you are watching your waistline.Making it half mayo, half sour cream won’t make a lot of difference in taste.If you have a European Deli Market store nearby,it’s better to use bologna called “Doktorskaya”from there.Otherwise it will taste great anyways.I know some people even use Oscar Meyer hot dogs, and it’s still good. Mix all the ingredients with mayonnaise or sour cream. *Finely chopped baby dill and green onions are optional.You can modify this recipe to your taste by adding more or less any of the above ingredients. I love the uniqueness of this dish. I definitely would make this one. Ohh Yeay!!! It's a must in Russian New Years table. Hey Nadia, thanks for stopping by and commenting on my blog! I love your blog and following back (Facebook too!). I adore this salad, coming from a similar (but partial) background myself, this salad is an absolute must in our menu for all the major holidays (and in between )!! Happy blogging!